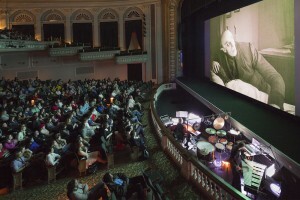 Savannah Film Festival 2014 – Special Screening of Nosferatu at the Lucas – Photography by John McKinnon courtesy of SCAD. We performed our score for the F.W. Murnau classic silent, NOSFERATU (1922), at the beautiful Lucas Theater, for the 2014 Savannah Film Festival. Thanks to all the wonderful staff and volunteers at Savannah College of Art and Design (SCAD) who helped us pull off this show without a hitch. Check out this great photo by John McKinnon, courtesy of SCAD. Somehow we manage to fill half the orchestra pit. We can’t wait to go back for another show!